I have been venturing out and trying some new foodie items. I am totally looking for foods that will make me feel good. I am so sick of all the sweets and heavy meals that I just want to start the New Year off right with a fresh clean eating habits. We all tend to lose them when the cold season hits. Ugh! Plus I received a weight loss program that I may or may not try, but I will share it with you in case you want to give it a go. More on that later. First up is Jamba Juice Cold Press Juices. I was asked to give these a try and how could I turn down Jamba Juice? It’s my favorite smoothie place in the world, plus they now have energy bowls, which I am in love with. Jamba Juices Cold Press Juices are located in the refrigerated section of the store. 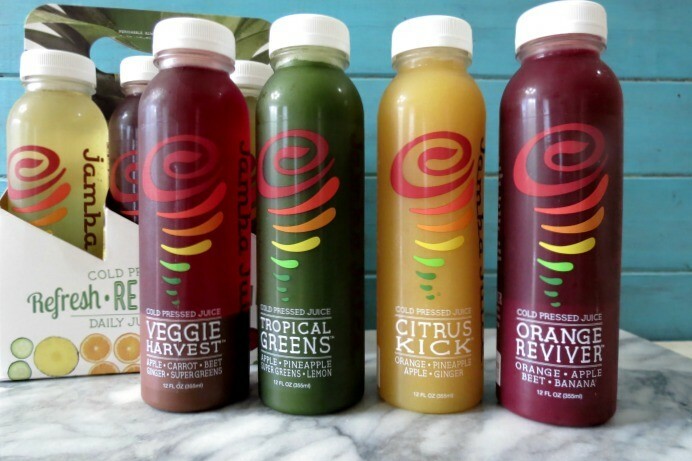 They come in 4 flavors; Veggies Harvest, Tropical Greens, Citrus Kick and Orange Reviver. My favorites are the Citrus Kick which has an orange flavor juice with a hint of ginger. The second one I like is the Tropical Greens. That one kind of threw me for a kick because I am not the biggest person when it comes to kale and lemon in my juices, but this juice is surprisingly light and refreshing and tastes like cucumbers. My next up is the Orange Riviver, this one tastes like orange with a hint of beet juice. I think that is why it is red in color? I’m not the biggest fan of beets, but this drink is pretty good and my Husband likes it too. The last flavor is Veggie Harvest. To me this one is just ok. It has a strong beet flavor, which I don’t care for, but I still found it light and refreshing and out of the juices the Veggie Harvest kept me full the longest. Each bottle of juice contains 7-10 servings of fruit and vegetables, which is perfect for those who do not get enough fruit and vegetables in your diet. Shame on you! Each 12oz. bottle has from 140 – 190 calories. If I recall each bottle of juice is $3.79. Jamba Juice has a 3 day juicing routine with a meal plan to help start you off with some good old fashion healthy living. I was planning on doing it, but um…. I drank the juices before I could do the cleanse. So that means I have to pick up more. I am going to try the plan starting on Monday. You know what’s funny? I actually woke up in the morning craving these juices over my morning coffee. I actually skipped the coffee and I didn’t get the caffeine headache. I think that is great , especially for me. 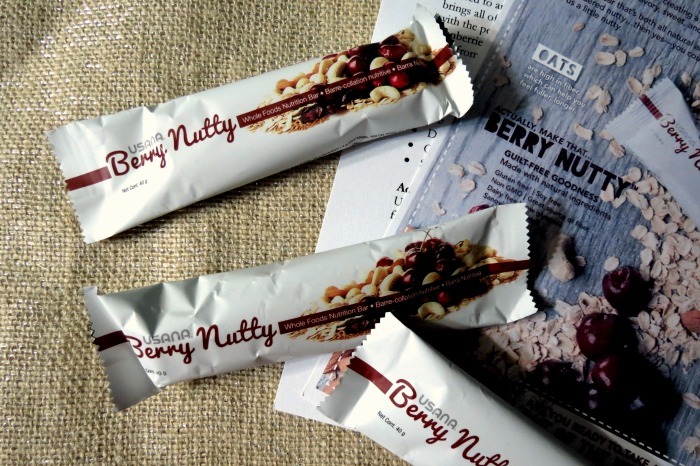 USANA’s Berry Nutty Bars. These snack bars are so good! They are an oat bar chock full of dried cherries, cranberries, almonds and cashews. All my favorite things. They are not super sweet, but have a nice fruity flavor. Plus they are only 160 calories, with 8 grams of fat, 4 grams of protein, 8 grams of dietary fiber, 22 grams of carbs and 9 grams of sugar. Plus, it’s low in glycemic, low in sodium, non-GMO and is free from gluten, soy, and dairy. I think these make for a nice healthy snack and beat a candy bar any day. You can find more information on the bars at USANA. 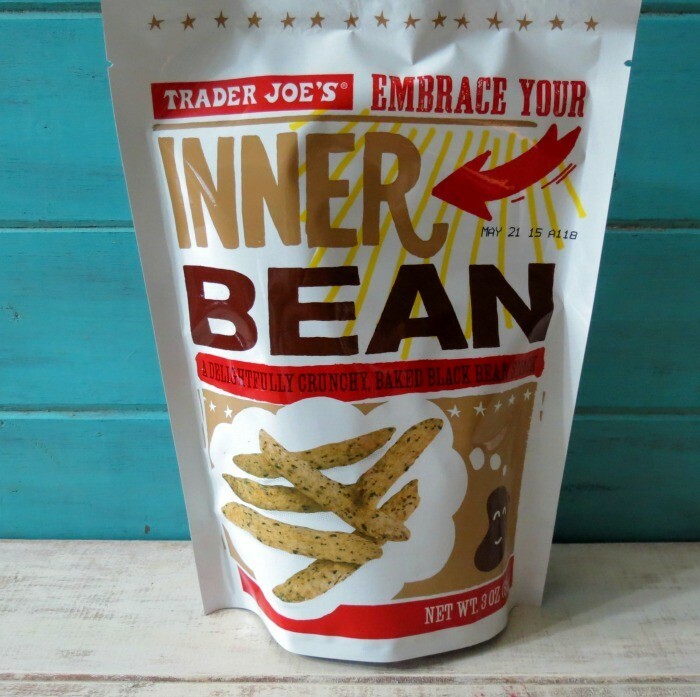 I was at good old Trader Joe’s and I saw they now have the Inner Bean. I have been a fan of the Inner Pea and could eat a whole bag in minutes. So I thought I would give the Inner Bean a try. They are not to bad, but I like the Inner Pea better. They are light, slightly salty and the end flavor is the same as the inner pea, which I think is the rice flour. They say it has a black bean flavor, but I don’t taste black beans and honestly, do black beans have much flavor? Each serving is 22 pieces and has 130 calories, 16 carbs, 5 grams of fiber, 1 gram of sugar and 5 grams of protein. For a quick snack, I think these are the right choice. You can’t beat the fiber and protein in them. From a rating between 2 to 5 I would give the Inner Bean a 2. You can find them at Trader Joe’s in the potato chip isle. It’s a deliciously fruity, dairy-free shot — the perfect daily dose of the good stuff you need to maintain a healthy, balanced system. * Just a few sips and you’re set for the day. Now for the fitness program that was e-mailed to me. Fitness Magazine teamed up with Eating Well Magazine to create a get FREE healthy program that includes meal plans and fitness plans to help you shed 10lbs in a month. That sounds good to me. Here is the info that I received. To join, participants can sign up online at MakeHealthyHappen.com by Jan. 5, 2015, when the challenge kicks off. Through Jan. 30, the campaign provides integrated content from FITNESS and EatingWell magazines, including daily recipes for healthy meals under 500 calories and a four-week workout plan, on the site. In addition to the dedicated landing page, participants will also receive weekly e-newsletters with meal and workout ideas. The program is supported with in-book promotions in both magazines and on social media with the #MakeHealthyHappen hashtag, shared Pinterest board, and Facebook chats and Twitter parties with expert trainers and dieticians. Well that is it for me. I have been doing pretty good on my eating habits the past week, which is pretty shocking for the week of Christmas. Now I have to get the ball rolling and start exercising. Have you made any New Years resolutions? If you did, do you stick to them? 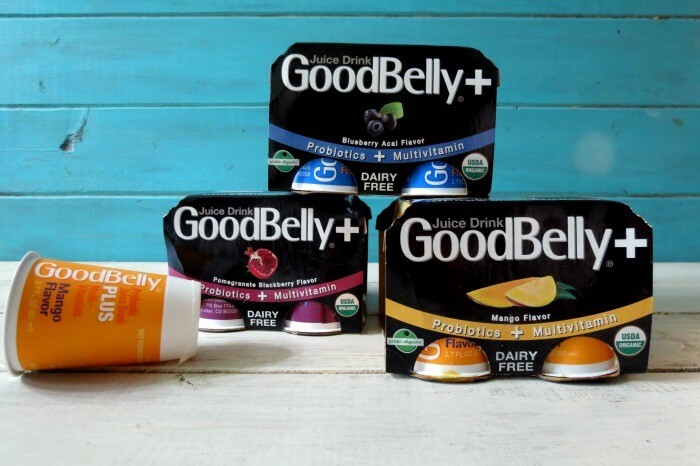 I really MUST try the Good Belly! I have been having some issues and this may help!